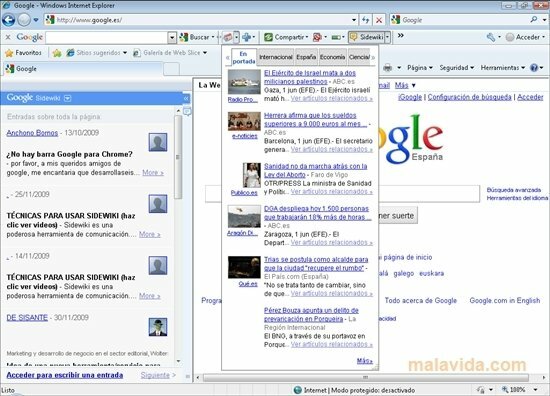 Google Toolbar Internet Explorer is a toolbar for the Microsoft browser that is very practical, because as well as having the most used search engine worldwide, Google also offers other very important services like YouTube (to view videos), Google Maps (that will allow you to view far away cities or find travel routes), Google Reader (to follow Atom and RSS feeds) and Picasa (for photos). Thanks to this great toolbar it will be possible to quickly access each of these services, in a very practical and dynamic way. - Access to the most important news every day. - Possibility to share any website that you are visiting by means of the various social networks and services (GoogleMail, Facebook, Twitter, Blogger...). - Translation of any text with a single click of the mouse. 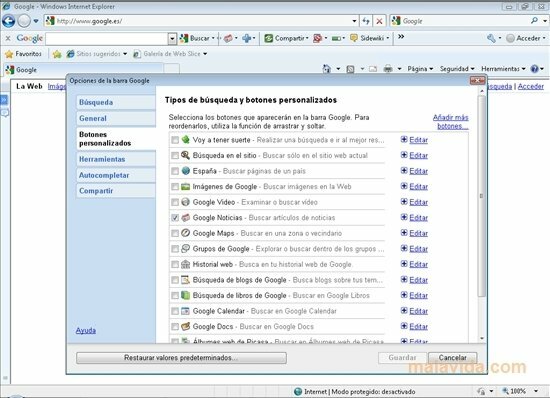 - Shortcuts to all Google's Internet services (Picasa, Google Video, Google Docs, Google Calendar,...). Discover a more practical way of enjoying your Internet experience, thanks to Google Toolbar Internet Explorer.